St Augustine Campground and RV Park Guide - Locations, Facilities, "Reviews"
- Locations , Facilities, Maps, & User "Reviews"
Anastasia State Park and Recreation Area Campground. 139 RV & Tent sites. Electricity and water, no sewer. Dump Station. Campground is secluded in a dense forest with ocean beach access a little over 1/4 mile away. (see Satellite view below) Bicycle rentals available. Anastasia State Park Campground gets good reviews except for some comments about mosquitoes - bring plenty of repellent just in case! Almost 5 miles of sandy beaches - bird sanctuary. Many facilities including hiking, Bath House, Nature trails, Playgrounds, Volleyball court, Concessions, beach equipment rentals, and picnic areas. Anastasia State Park is a good St Augustine Campground option. To Florida State Parks Anastasia Web Site with several photos including St Augustine Campground campsite one above + Aerial Location Map with Map, Satellite, & Aerial Hybrid View options. To a Saint Augustine Florida Beaches Guide + pictures and a zoomable map link showing beach locations. - Tips - Double click on Aerial Location Map/Satellite image above (not on teardrop) to "center" on a map location - then click "+" to zoom in. - single click on map area and then use your keyboard arrow keys to more "precisely" shift map area view Vs using arrows on map image which "jump" some distance. - "Hybrid" view shows Satellite View with street map superimposed. Useful! 150 sites with Elect, Water, Sewer, Cable. Toilets, showers, tent/RV Sites. Outdoor Pool. Ocean Beach access across the road - Intercoastal waterway at other end of camp. Large campsites with many trees + vegetation and trees between sites. 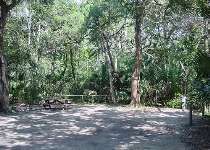 This Campground gets very high user reviews and is a good St Augustine Campground and RV Park option. .
To a St Augustine Day Trip page with "Must See" Attractions list plus descriptions, times to allow, and Info Links. 105 RV sites with Elect & Water. 50 Acre wooded area. Most campsites have trees and are fairly large. Most sites have cable TV hookup. Dump Station. Toilets & showers. Indian Forest Campground gets generally good user reveiws and could be a good St Augustine Campground / RV Park option. To the Indian Forest Campground St Augustine web site. To St Augustine, FL Attraction + Beach Info -- Pictures, Info Links, and Tips. 120 sites with elect & water. Dump Station. All sites have cable TV. Some tent sites. Toilets & Showers + Pool. Partially wooded area next to a small lake. Park has been recently renovated and re-paved. Most sites have some shade. The User Reviews of the St Augustine Beach KOA Campground have been both good and bad since their recent renovation. A St Augustine Campground / RV Park option that you may want to check out in person before you commit to a stay. To St Augustine Beach KOA Campground Web Site with some pictures. Over 200 RV sites with elect, water, and sewer + many Park Model rentals. Toilets, showers, large pool. Tennis courts & a basketball court. Oceanfront resort with some oceanfront sites for extra fee. This Saint Augustine Campground / Resort gets some good and some mixed user reviews. Some say this resort is a bit pricey. The Bryn Mawr Ocean Resort has Ownership Options. 198 RV sites with water, elect, cable. 20 tent sites. Toilets, showers, pool. Dump Station. Small sites, few trees. No nearby beach access, even though resort is close to beach. In recent years, this St Augustine Campground gets average to above average user reviews. To Ocean Grove Camp Resort Web Site. More Info on St Augustine Florida Beaches at this Old City St Augustine Beaches web page. Florida St. Augustine Attractions Day Trip - to "Must Sees," Tips, and Pictures - including Lightner Museum and historic Alcazar Resort Hotel + link to St Augustine Campground Guide page. . Attraction Discounts - Many discount travels savings available for those of all ages on family budgets who search them out -- "over 50ers" and the Grey Haired "Seasoned Citizen" set often can get some special discounts we talk about here! (It never hurts to Ask!) Also see the link on the above page to some special discounted travels ideas for "Under 50 Travelers" too.